Griffin & Associates, P.A. is a small, well established and highly regarded law firm in the Tampa Bay community. Our attorneys oversee an efficient staff of paralegals and assistants who provide the necessary support to the lawyers and the clients. Our firm has cultivated long-term relationships with various experts to assist in the analysis and presentation of our cases for either mediation or for a court proceeding before a judge, magistrate or hearing officer. Some of the experts used by the firm include accountants, appraisers, business valuation firms, vocational or rehabilitation experts, private investigators, child custody evaluators and other mental health professionals to assist both our clients and our lawyers with the non-legal aspects of our clients' matters. The mediation process is utilized frequently in our firm and some of Florida's most skilled mediators attend sessions at our office due, in part, to our spacious and comfortable accommodations. Our courteous and helpful staff also assist in making the Alternative Dispute Resolution process a preferred choice for our clients. 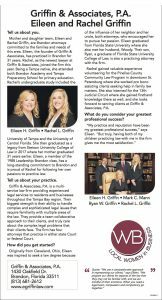 We would like for your experience with Griffin & Associates, P.A. to be satisfying and our team of lawyers, support staff and experts work very hard together to accomplish that goal. The Law Offices of Griffin & Associates, P.A. 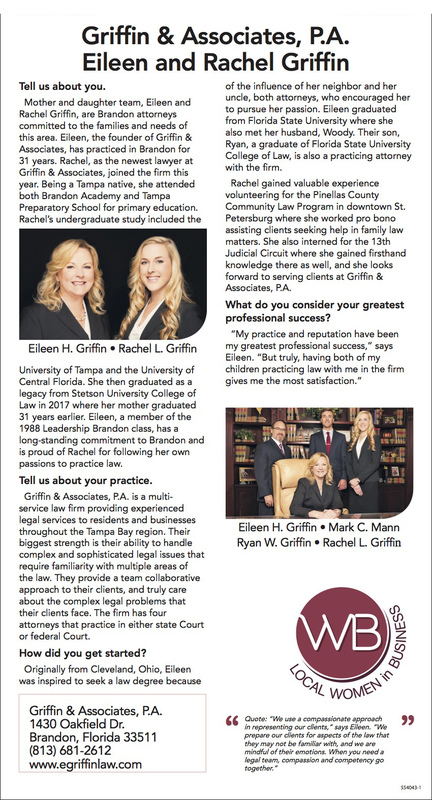 © 2019 The Law Offices of Griffin & Associates, P.A. Copyright © 2019 The Law Offices of Griffin & Associates, P.A.